The first Ariane 5 mission in 2017 – and Arianespace’s second launch this year – orbited two relay satellites from French Guiana today to continue the company’s long-term relationships with telecommunications operators and satellite manufacturers. 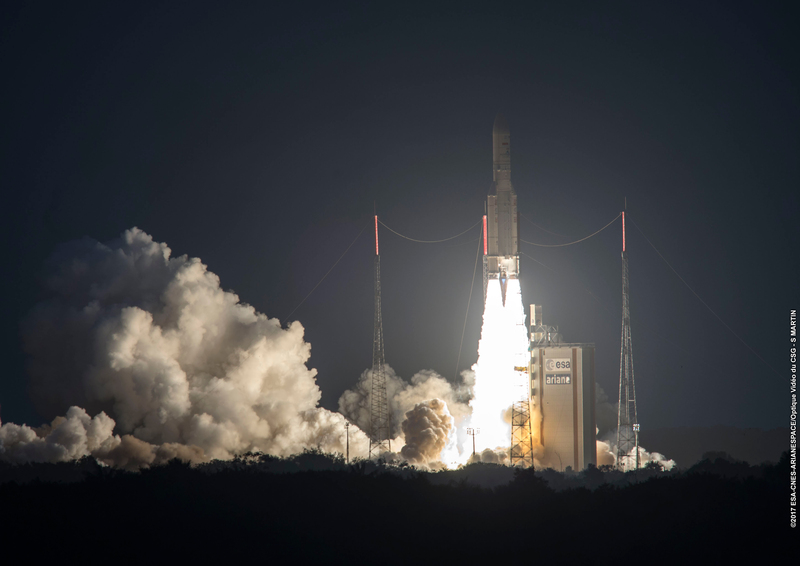 With an on-time liftoff from the Spaceport’s ELA-3 launch zone, the workhorse vehicle for Arianespace Flight VA235 placed SKY Brasil-1 and Telkom 3S into geostationary transfer orbit (GTO) during a mission lasting just under 40 minutes. After its on-time departure from the Spaceport, Arianespace’s Flight VA235 deployed SKY Brasil-1 and Telkom 3S into geostationary transfer orbit. “I am truly thankful to the Arianespace team – guys, you are the best,” said Luis Otavio Marchezetti, Engineering Director, Sky Brasil Serviços Ltda., in comments at the Spaceport after SKY Brasil-1’s deployment. Arianespace’s Flight VA235 launched Telkom 3S for Telkom Indonesia as part of a turnkey contract with Thales Alenia Space. Martin Van Schaik, the Senior Vice President – Sales and Marketing for Thales Alenia Space called the launch “magnificent,” and thanked Arianespace for yet another “by the book” mission success. Israël noted that SKY Brasil-1 was the 116th satellite built by Airbus Defence and Space to be launched by Arianespace, with 17 more from the manufacturer in Arianespace’s backlog. Telkom 3S was manufactured by Thales Alenia Space, and it marked the 146th spacecraft produced by the company to be orbited by Arianespace, which has nine more in its backlog. Ariane 5’s total payload lift performance on today’s mission was 10,450 kg. This total included the liftoff masses of approximately 6,000 kg. for SKY Brasil-1 and 3,550 kg. for Telkom 3S, plus the Ariane 5’s SYLDA dual-passenger dispenser system and payload adapter hardware. The launcher was delivered to Arianespace by Airbus Safran Launchers as production prime contractor. At 27 minutes into Flight VA235, Ariane 5 deployed SKY Brasil-1 from the launcher’s upper payload position. Developed for utilization by AT&T/DIRECTV via its DIRECTV Latin America subsidiary, SKY Brasil-1 will expand direct-to-home high-definition programming for Brazil. The spacecraft was produced in Toulouse, France using Airbus Defence and Space’s Eurostar E3000 platform, and will operate from an orbital slot of 43.1 deg. West. Telkom 3S was in the Ariane 5’s lower payload position, and was produced by at Toulouse and Cannes, France, based on Thales Alenia Space’s Spacebus 4000B2 platform. Designed for the delivery of high-definition television services, as well as mobile communications and Internet applications for Telkom Indonesia, Telkom 3S will provide coverage over Indonesia and Southeast Asia from an orbital location of 118 deg. East. – Perigee: 250.0 km. for a target of 250.0 km. – Apogee: 35,908 km. for a target of 35,883 km. – Inclination: 3.99 deg. for a target of 4.00 deg. With today’s launch success, Arianespace maintains its 2017 mission cadence – which targets 12 missions from the Spaceport with the heavy-lift Ariane 5, medium-lift Soyuz and lightweight Vega. The next liftoff is scheduled for March 6, using a Vega launcher to orbit Sentinel-2B, which is the latest addition to the European Union’s Earth observation satellite fleet called Copernicus. Arianespace opened its 2017 mission activity by launching a Soyuz on January 27, successfully delivering the Hispasat 36W-1 telecommunications satellite into geostationary transfer orbit.